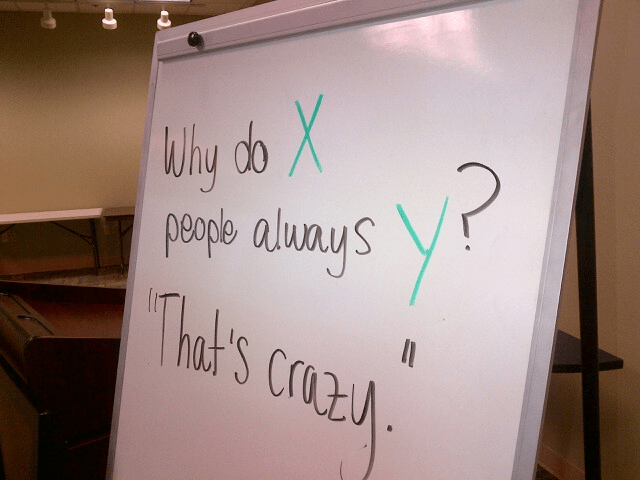 Whenever we hear others say something like, “Why do X people always Y?”, that’s a cue that there might be a breakdown in communication happening due to differences in culture. For example, “Why do Hispanic patients always have two last names?” “Why are these patients always late to their appointments?” This can be an opportunity for an interpreter to bridge cultural gaps and provide a missing piece of the puzzle that can help make sense of it all. To break down barriers to communication that exist because of differences in culture. But first, we have to become aware of our own assumptions. We have to pay attention to our own thoughts. When listening to someone else, how many times have you thought to yourself, “That’s crazy.” The truth is, every thing that every person says or does has a reason behind it. As interpreters, it’s up to us to put our own assumptions aside and be open to asking questions that will lead us down the path of discovery that brings us to understanding. As interpreters, our job is not to change beliefs or convince anyone that one way is better than another. Our job is to provide enough cultural context so that the listener can understand without judging or being offended. In the end, everyone has a story to tell. And they have a right to tell it, in a language that’s understood by the listener, without judgement.